VSAN Hardware Design Guide 1.0 Released – Check it out! vSphere Homelabs in 2014 – Scale Up or Scale Out? You can also use this utility which do have a GUI. VDP Advanced can backup application that are Not virtualized yet – did you know? VMware Horizon View 5.3 brings Windows 8.1, IOS 7.0, vDGA and VSAN support! What’s New in VMware vSphere 5.5 Platform (new PDF) – 25 pages. What’s New in VMware vSphere with Operations Management 5.5? This is a directional statement. Over the course of the next several release cycles for vCAC and vSphere product lines VMware expects all the use cases of vCD in the enterprise to be fully accommodated. 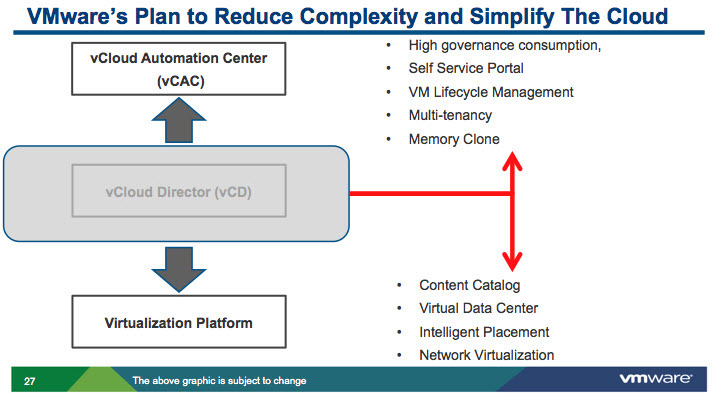 vCD 5.5 will also ship with the vCloud Suite release in 2013 as part of this strategy.